Weston & Sampson’s aquatics group specializes in aquatics design, engineering and construction for waterparks, resorts, municipalities, collegiate, and international services for all aquatic needs. 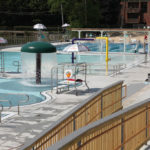 Our portfolio of indoor/outdoor waterparks, multi-generational aquatic facilities for public agencies, and competitive-level swimming pools for academic institutions complements our aquatic design, construction, maintenance, and repair capabilities, offering clients comprehensive services and one-stop shopping. Recently Completed Pools- Pools recently completed by Weston & Sampson include several high-profile properties, including the Boston Celtics training facility, Resorts World Catskills, among others.